FaithStreet has created a free, online tool to help you increase pledge participation. It’s called Pledges, and you can find it under the Goals tab in your FaithStreet dashboard. 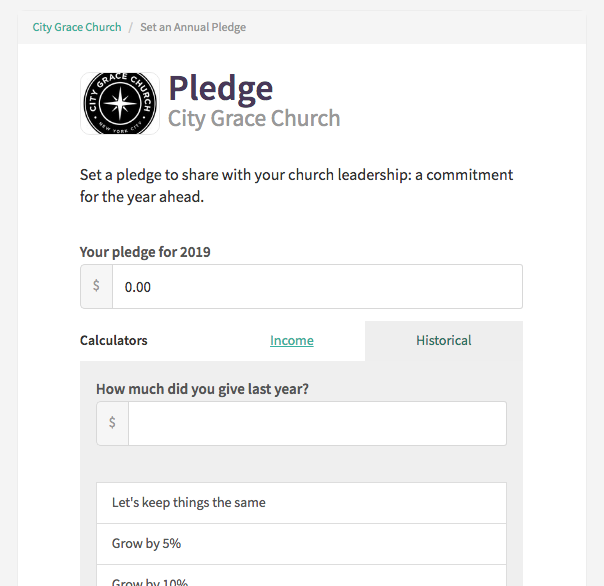 To get started with Pledges, embed our Pledges button on your church’s website. Go to your dashboard, click Goals and click Embed Pledge Button. Then, copy and paste the code there into your website’s HTML editor. Need help? Our team is happy to assist. Real Commitment: Pledges are created as shared commitments to annual giving. We treat them a bit differently than goals. Goals are personal. When setting a giving Goal, a giver can choose to share that amount with you or keep the total amount hidden. Pledges are always shared with FaithStreet admins.